The third Sunday of Advent, like each of the Sundays in Advent, has a traditional theme. The first week we talked about hope, last week about peace, and this week we focus on joy. And as we get closer and closer to Christmas, joy seems to surround us. It’s right there in our Christmas carols, and on our cards and decorations. Joy feels natural this time of year. And so it is easy to hear texts like the one we read today from the letter to the Thessalonians and agree. Hear the words again: Rejoice always! Pray without ceasing. Give thanks in all circumstances, for this is the will of God in Jesus Christ for you! It’s easy to see why this is the text that churches read on this third Sunday of Advent. It’s all about joy, and who doesn’t like to hear about joy this time of year? And so, as we light our candles, we can boldly proclaim our joy in our words, and in our prayers, and in our songs. Christmas is almost here, and we are joyful. But, what about those times when joy feels impossible? What do we say then? Two years ago today I was getting ready to preach about joy. It was the Friday before the third Sunday in Advent. I had been married less than a month before, and I still hadn’t come down. I was on top of the world. Joyful beyond words. And that day we were at the grocery store buying things to make Christmas cookies. And when we got home I was planning to write a sermon that would have rivaled George Bailey’s joy at the end of “It’s a Wonderful Life”. I think that in the church we sometimes don’t do a very good job of acknowledging the realities of the world. We talk about hope, and peace, and joy, and love. But do we also talk about the hard things that are happening in the world? Things like violence? Things like tragedy? Things that defy understanding? Too often we don’t. We gloss over those things and focus instead on the brighter, or happier stories. And then we wonder why people worry about whether they will be welcome in church. Because if we don’t acknowledge the pain and suffering in the world, and instead just say “be joyful”, how can anyone tell us their stories? How can they talk about when they are mourning? How can they talk about when they are depressed? How can they talk about losing their job and scrambling to make ends meet? That’s one reason we have our Blue Christmas season here. Because we know that hard things happen, and that sometimes it might feel like there is no room for that in the Christmas season. Because some years the holidays are just plain hard. We understand, and we make room for that. Because whatever you are going through in your life, you are welcome in church. And you are welcome to carry those things that are hard into this space as well. Because if you can’t bring them here, where can you bring them? But, at the same time, the church has an obligation. And that is to not just acknowledge the brokenness of the world, which we must do, but to also go one step forward and proclaim that it doesn’t have to be that way. There is another way. And in Advent we point to that fact, and we point with hope to the future, and to the way Christ is coming into this world. The passage we read from Thessalonians reminds us of that. It’s important to remember the context of this letter that tells us to “rejoice always”. Like many of the Apostle Paul’s letter it was sent to a church that was going through a time of uncertainty. They were figuring out how to be some of the first followers of Jesus Christ at a time when no one understood them and what they were doing. And professing your faith in Christ, at that time, could often come with harsh penalties. And so Paul was writing this letter to them to encourage them, and to remind them to continue to live in hope and joy, even when it was hard to be hopeful and joyful. And he tells them “don’t quench the Spirit.” In other words, do not let anything extinguish your joy. So what did I say on that Sunday two days after Newtown, two years ago? I’ll tell you this first, what I said did not make everything better. And it didn’t erase the pain of what had happened. It probably even sounds a little ridiculous now, but bear with me. Because that day the best I could think about to say was to talk about the color of a candle. You may notice that today’s candle on the Advent wreath isn’t blue like the other three. It’s pink. The traditional color for Advent is purple, which is meant to represent what is royal, like the coming Prince of Peace, but also to show repentance, and the turning away from what is and towards something better. And churches used to take this very seriously, and the four weeks before Christmas for centuries were very somber and penitent. And they called this Sunday “Gaudette Sunday” which means “rejoice”. And so, we light the pink candle because just as the white mixes with the purple and transforms it, we are waiting for Christ’s light to break into our world and bring the joy that feels so elusive. We stand here in the real world, at the junction of where pain and hope meet, and we look for something better. We long for joy. And we sing, “O Come, O Come, Emmanuel”, oh come God, and be with us. I think he was right. Because if joy can be lost or gained so quickly, it’s just happiness. Not a bad thing, but not such a long-lasting thing sometimes. But the joy that comes with Christ sticks around. It’s there in the best of times, but it’s even there when times are hard. You can be a joyful person and still cry alongside the world. Because being joyful means you know it isn’t supposed to be that way, and you believe it can be better. About a year and a half ago, a few months after Newtown, the Boston marathon bombing happened. We were married at Old South Church, the church right at the finish line of the Marathon that sustained some damage in the explosions, and just a few months before we had stood only feet from where the bombs went off to take our wedding photos. And when we watched the coverage on the news, I felt like someone had punched me in the gut. About a week later, before they even opened the streets back up, we went down to Boston for Old South’s first worship service in the aftermath. And I spent some time walking around the streets there by Copley Square. Police tape blocked off a lot of the area, but every time there was a barricade there was also something else. People had taken chalk and written messages on the sidewalks. Messages of hope. Messages of healing. Messages of peace. I walked the streets reading them. And there was one message that captured me in both it’s simplicity and its depth. 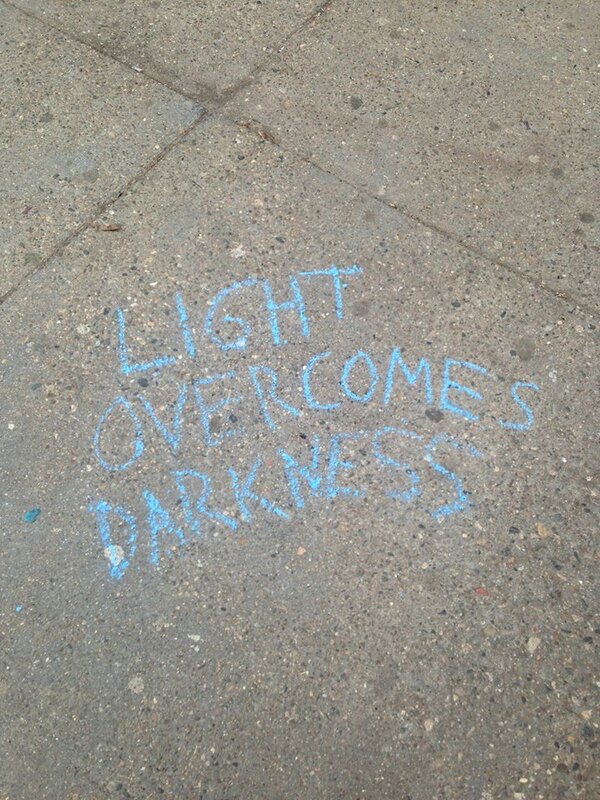 There, on the sidewalk, in blue chalk, someone had written simply “light overcomes darkness”. I think that’s when I stopped feeling like someone had punched me, and I started to remember that violence and anger and destruction don’t get to have the last word. Only God does, and God sent Christ to this world not just so that we might live, but so that we might have a deep abiding joy. On Christmas Eve we read a passage from the Gospel of John, one that the person who wrote that chalked message on the sidewalk may or may not have know: “The light shines in darkness, and the darkness has not overcome it. In other words, Christ is the light of the world, and the worst that the world can do is still not enough to extinguish that light. And if that light cannot be extinguished, than neither can that joy.